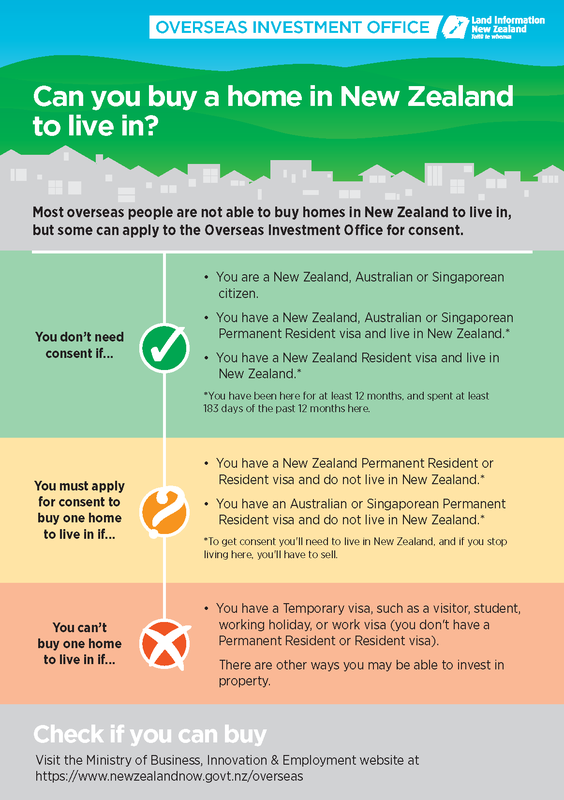 Certain overseas people can apply for OIO consent to buy one New Zealand home and live in it. Can you buy a home to live in? If you are eligible to apply for consent to buy or build one home to live in, you will find all of the information and the forms you need on this page. You can check whether you are eligible to apply, on the New Zealand Now website. The simple guide also gives you an overview of the rules, or you can use the flow chart. It is important that you find out whether you need consent to buy before you sign a sale and purchase agreement as there are significant penalties if you don’t get consent first. If you are interested in learning about other options for investing in New Zealand, you can learn more on our OIO web pages. If you would like to print multiple copies of this guide, we have also provided a version that will give you two copies per page. As all printers are different, you may need to adjust your settings. In most cases, the settings landscape, print on both sides and flip on short edge will work. 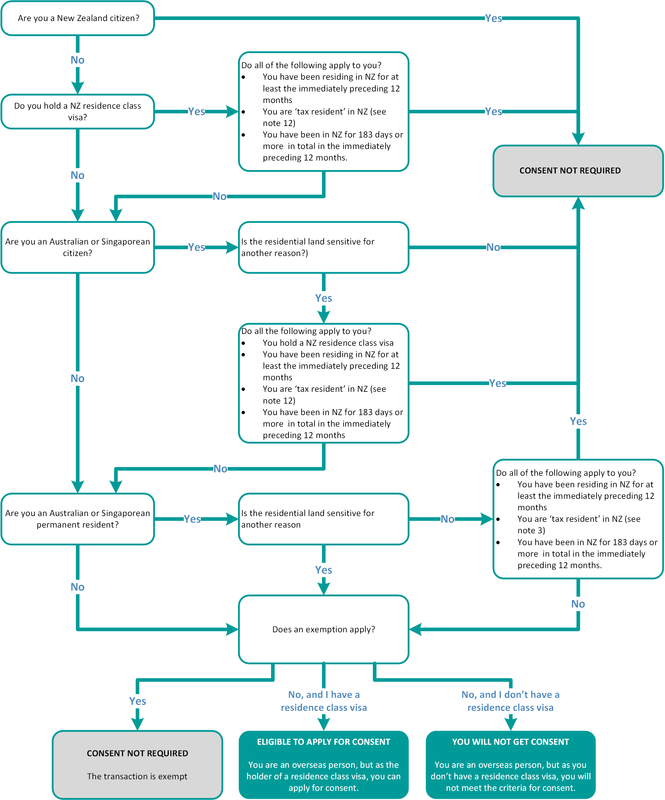 Use this flowchart to work out if you need consent from the OIO. These laws apply to homes that are categorised as ‘residential’ or ‘lifestyle’ on the District Valuation Roll. You can check properties on websites, such as www.qv.co.nz, or ask the local council. For other types of homes and land, different rules apply (see residential land that is also sensitive for other reasons). This is Government House in Auckland viewed on the QV website at www.qv.co.nz. Once you have determined that you need consent from the Overseas Investment Office to buy or build a home to live in that is classed as residential or lifestyle, you can apply using the forms on this page. You must apply for consent as early in the sale process as possible, and you can apply for pre-approval before you have found the property you want to buy. Your lawyer needs to have your Overseas Investment Office consent number before you can complete the sale. Simple consents could take up to 10 working days to be granted. The fee for individuals is $2040. You can still sign a sale and purchase agreement without consent, provided that the agreement is conditional upon consent being granted. If you need consent, but sign an unconditional agreement without it, you may face significant penalties and have to sell. If you make a false statement, you could be fined up to $300,000. live in the property as their main home. be present in New Zealand for at least 183 days in each 12 month period after consent is granted. continue to hold a residence class visa, or continue to be an Australian or Singaporean citizen or permanent resident. If you don’t meet these conditions, you may have to sell the land, and / or face penalties and fines. These conditions will cease to apply if you become a New Zealand citizen or become ordinarily resident in New Zealand. When you are ready to buy a home, your lawyer will ask you to complete a Residential Land Statement to say whether you are eligible to buy. They will help you do this. It is important that you talk to your lawyer before you sign a sale and purchase agreement. If you need consent, but sign an agreement without it, you may face significant penalties. Alternatively, you can make the agreement conditional on the consent of the Overseas Investment Office or get pre-approval before you find a property to buy. If you are a couple, you don’t both need consent if you are buying the home as relationship property. This includes people who are married, in a civil union, or a de facto relationship. If one of you is a New Zealand Citizen, then neither of you need to apply for consent. If one of you holds a residence class visa, has been living here for the past 12 months, has been present in New Zealand for at least 183 days in the past 12 months, and is tax resident, then neither of you need to apply for consent. If one of you is an Australian or Singaporean citizen, then neither of you needs to apply for consent. If one of you is an Australian or Singaporean permanent resident who has been living here for the past least 12 months, has been present in New Zealand for at least 183 days in the past 12 months, and is tax resident, then neither of you needs to apply for consent. If at least one of you has a residence class visa, or is an Australian or Singaporean permanent resident, but has not been living here for at least six of the past 12 months, then only they will have to apply. The other one does not need to apply, regardless of their visa status. 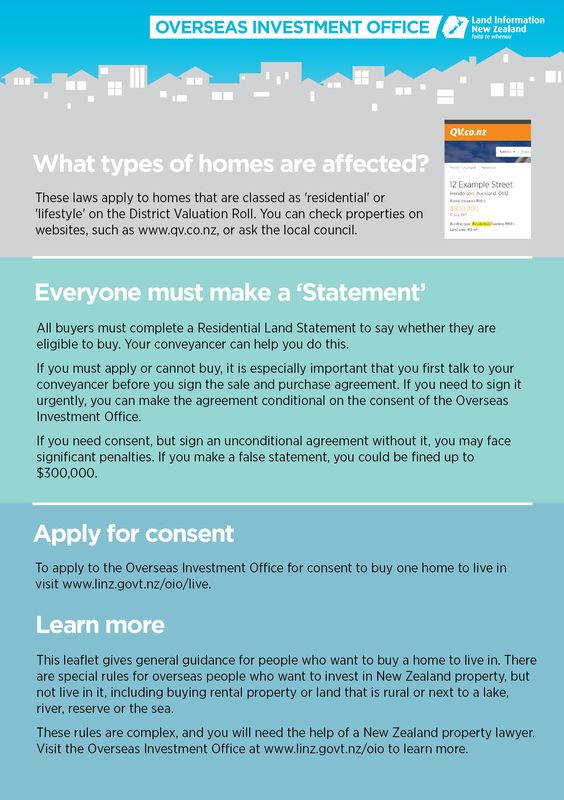 But please note that Australian and Singaporean citizens and permanent residents who want to buy residential land that is also sensitive for other reasons always need to apply for OIO consent. If you have bought as a couple, but later separate or divorce, both parties can keep their share of the relationship property without having to apply for consent, even if they are overseas people. If you inherit a home, you may be able to keep it and live in it without applying for consent. However, the rules are complex and depend on when the property was originally purchased and whether OIO consent was required for that purchase. You should take legal advice if you are inheriting a home. If you are an overseas person, you can apply for consent to buy a home to live in using a trust or a company. The trust or company itself is generally considered an ‘overseas person’ if it is 25 percent or more overseas owned or controlled by an overseas person. To be able to get consent, all of the people who own or control the trust or company must be ‘qualifying individuals’. This means people who are either New Zealanders, people who are ordinarily resident here, people who hold residence class visas, or Australian and Singaporean citizens and permanent residents. All the people the Overseas Investment Office considers to own or control the trust or company will be required to live in the house. You can learn more about this on our web pages, but this is a complex area of law and you will need the help of a New Zealand property lawyer. The fee for an application for consent by a trust or company is $3900 for land that is residential or lifestyle only, and will take longer than an application by an individual. Some residential or lifestyle land may also be classed as sensitive for other reasons. If land is residential and also sensitive for other reasons, different rules apply. It can be difficult to work out if land is also sensitive for other reasons, but in general it will be land that is rural or next to a lake, river, reserve or the sea. These rules are complex and you will need the help of a New Zealand property lawyer. As a guide, fees for this type of consent range between $24,600 and $31,600 and can take significantly longer than consents for land that is residential or lifestyle only. There is more detail in the application templates. Download the template for your situation and save it to your computer. Once it is completed, you can use the online submission link to apply. From inside the link you can upload your completed template and other documents. Online submission for one home to live in applications. We will endeavour to decide your consent applications within 10 working days for individuals where land is residential only. If you discover you have accidentally broken the rules, and bought without consent, you must let us know. For example: you may have been given incorrect legal advice by your lawyer about whether OIO consent was required. You may be able to apply to us for a retrospective consent. However, in addition to the usual application fee, you will also face a penalty of up to $10,000 depending on the value of the home. There is more detail on our Retrospective applications page. The provisions covering people wanting to buy one home to live in can be found at Schedule 2, Part 2 Commitment to reside in New Zealand test. The provisions covering spouses can be found in the Overseas Investment Regulations 2005, Part 2 regulation 58 Exemptions relating to relationship property where spouse or partner granted consent under commitment to reside in New Zealand test, and regulation 45 Exemption for relationship property. The provisions covering fees and penalties can be found in the Overseas Investment Regulations 2005, Schedule 2, Part 1 Applications relating to transaction in category of overseas investment in sensitive land only – residential land. The provisions covering Australians and Singaporean citizens can be found in the Overseas Investment Regulations 2005, Part 4, regulations 70 to 83.